Kei has white hair Similar to his father, he has a sword one like one of the legendary seven swords. He is tall, and not really short but is 5'3, about average. He has light, icky green eyes. He is pale and has very sharp like teeth. Personality:Kei appears to be indifferent, caring for only a few things around him. He spends a considerable amount of time mocking other Chuunin or Genin. Kei also shows a desire to collect swords. He also spends alot of his time in the water or training. Kei is trying to make his way up to a Genin, but by doing this he cannot be mean to other fellow shinobi. Kei tries to be different then all of the other shinobi in the leaf village. He tries to act dumber but is actually pretty smart, he is smarter than most of the students in his class. Description: Forms beads of water on the palms of your hand, each bead contains a small amount of poison. When the user makes a successful strike against the opponent, the opponent becomes light headed and confused for a short period of time, allowing for a succession of blows from the user. Description: Creates a thin wall of water around the user, it is capable of blocking one D ranked or lower ninjutsus before it disperses. Description: The user releases water from their mouth, filled with toxins. It covers a 20 meter radius and if stepped in will paralyze the opponent for 5 minutes. However it takes a long time for the jutsu to be activated and can leave the user immobile while dispersing the liquid from his/her mouth. History: Child Arc-When Kei was a child he experienced many conflicts. His mother got killed by his father, and his mother tortured him, that is why his father killed his mother without Kei knowing. But as he got accepted into the Academy he bought Kei a Katana. 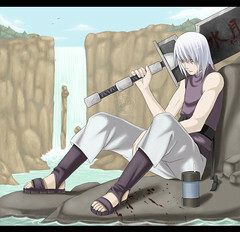 His father told Kei if He made it to genin rank he would buy him a sword that would make his a great shinobi. He and his father trained almost everyday. His father never told Kei that he killed his mother, he just told him she was attacked by betrayers of the leaf village. He still prays every night that his dad will marry another person. Kei also wants to be the strongest student in his class. He wants to be the most skilled too. Rp Sample: Kei ran through the forest looking for somewhere or something to hide in. He finally found something, he hid in a log. The Ninja ran by without noticing anything. Kei then jumped out of the log and ran eastward towards the village hidden in the mist. He knew his long Missing Nin Sensei would be hiding somewhere along the outskirts of the village. He finally found Kyoudai Hozuki, his sensei. “Welcome back student did you get me what I need” Kyoudai asked. Kei then replied “Yes sir here it is” Kei handed Kyoudai a basket of berries. I have to say unapproved mainly because we do not know if we are going through with Bijuu. That is the canon storyline and our storyline has been fully approved yet. Also, even if we did allow bijuu i wouldn't give you the rank frankly because you need a whole lot better profile that what you are giving out. Bijuu are to be for the best of the best and those that aren't going to play God in every post only because they have a bijuu. Lastly, there is no Nanbi. I'm not sure whether your referring to the Sanbi (which is probably the one), or the Nibi. Still like i said, i'm not sure if we are going to use Bijuu here.